AutographsForSale.com offers a wide variety of display cases and holders for baseballs, baseball caps, basketballs, footballs, hockey pucks, jerseys and other items, ranging from simple to spectacular. NOTE: display cases and holders are NON-RETURNABLE. 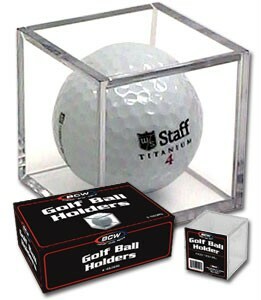 Every autographed baseball, golf ball and hockey puck purchased on AutographsForSale.com comes with a free hard plastic cube display holder.